Fifty-six years after he won the last Formula One Grand Prix held in Switzerland, the Maestro is applying a dab of oppo yet again at the Geneva Motor Show. Why the gap? Motor racing was outlawed in Switzerland after the 1955 Le Mans disaster. It was not until 2007 that the ban was lifted, allowing the Bremgarten grands prix of yore to become Technicolor history. The last one was held in 1954, the year when Juan Manuel Fangio was lured from Maserati to drive for Mercedes-Benz. After winning back-to-back championships for the German team—which will return to Formula One next weekend in Bahrain after a 55-year-gap—and a year at Ferrari, Fangio returned to Maserati for 1957 to win his fifth and last world title in the very car he abandoned to drive the Mercedes-Benz W196: the Maserati 250F, pictured here. 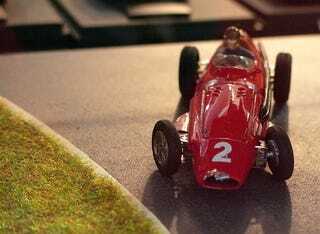 The incredible attention to detail on this model, which commemorates Fangio’s win at the 1957 French Grand Prix, extends to Fangio’s trademark short sleeves and his finesse at four-wheel drift, the driving style required for 1950s front-engined grand prix cars. It is for sale here at the motor show and you can have #5 of the 29-piece run for the low, low price of CHF 450, which is just about the same amount in US dollars.